Whether you’re replacing the glass on your existing table or you want a high-quality sheet of glass for your easy DIY coffee table project, Glass Doctor is the place to look. We custom-make replacement glass tabletops out of tempered or laminated glass in whatever size and shape you want. You can even customize the bevel to create just the right look. You’ll find that the cost of your customize glass tabletop is much less than buying a new glass-top coffee table. Then, you just need to be resourceful and find a way to elevate the glass off the floor. Here are some options to consider. 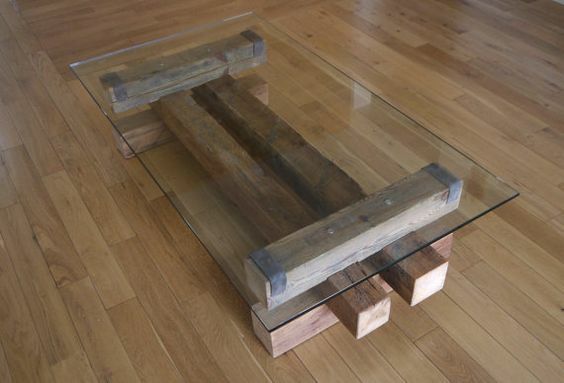 If you have a modern/industrial theme in your living room, creating a coffee table out of glass and cinderblocks could match the décor perfectly. All you need are four cinderblocks from a home improvement store, rubber pads to protect the glass, and felt furniture pads to protect the floor. Moving this type of coffee table is a breeze – the pieces come apart effortlessly so you can carry them one at a time. Get more inspiration for your cinderblock coffee table from Remodelista. For a farmhouse coffee table look, consider building the legs out of reclaimed wood from a millwork center or lumberyard. You can fashion the wood into any shape or design you want. Set the beams upright in each corner like this, stack them like Jenga blocks, or cut notches out of the wood like this so they fit together with no nails required. Just remember to protect the glass and floor with rubber and felt pads. Did you recently remove a tree from your yard? 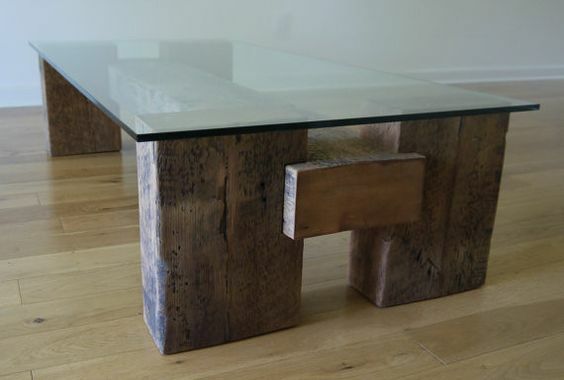 You might be sad to see the ancient oak gone, but you can upcycle the stump into the perfect pedestal for your DIY glass coffee table. The look goes best with a country or log cabin-style home. A traditional circular tabletop looks nice, but for an even more organic appearance, have your custom glass sheet shaped to match the contours of the stump, as seen in this image. You can also bundle several small stumps together to create a sturdy base for the glass tabletop, as described on allyou.com. Are there any wine lovers in the house? 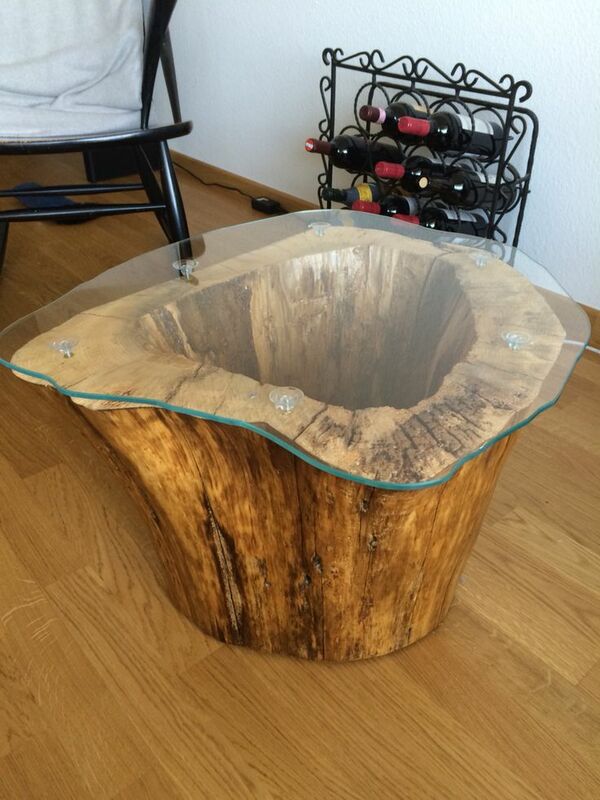 An old, rustic barrel coffee table base could be the perfect way to showcase your passion for vino. To bring the barrel down to size, first cut it in half “long-ways” with an angle grinder. Create a base for the barrel to sit on with hardwood planks cut into the shape of the barrel. Place the half-barrel on the base and fill the barrel with whatever you want on display through the glass tabletop, such as corks and empty wine bottles as seen in this image. 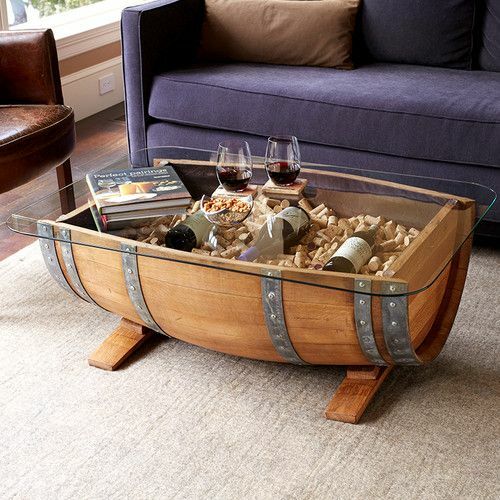 For more instructions on how to make a wine barrel coffee table, check out Handyman Tips. Clean up some old tires and turn them into the base for your glass coffee table. Paint them, wrap them with rope, or even upholster them to create the look you want. Pinterest has a lot of ideas to inspire you. 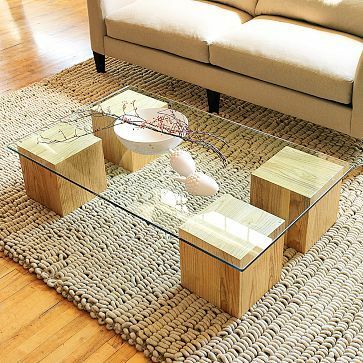 Did your coffee cup stain your new DIY glass coffee table? Clean it up with tips from Molly Maid. Then, get more easy DIY project ideas from Glass Doctor.